Of all the Hogwarts houses, Hufflepuff is the only one that’s defined principally by what it is not. It’s not shady, like Slytherin. It’s not brave, like Gryffindor. It’s not brainy, like Ravenclaw. It’s long been perceived, even among die-hard Harry Potter fans, as essentially featureless, an identity for those without much of an identity. Not anymore. In Matt Cox’s superb tribute to the house, Puffs, Hufflepuff is rendered a plucky, peppy underdog whose extraordinary averageness is worth cheering. 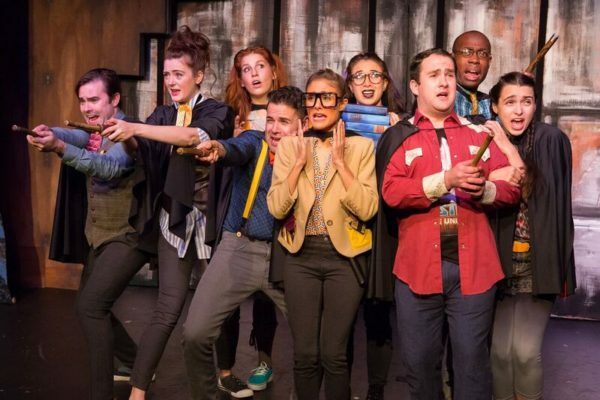 In the process, Cox gives the expansive world of Harry Potter a lightning speed sendoff, and it’s the greatest treat for Potter fans since the University of Michigan’s 2009 cult parody (and online sensation), A Very Potter Musical. Unlike that show, Puffs doesn’t merely lampoon the Potter universe, it expands it, adding new characters, new stories and a whole new imagining of J.K. Rowling’s invention. What Wicked did for The Wizard of Oz, Puffs does brilliantly for Harry Potter. Like Rowling’s story, Cox’s narrative centers on a trio of friends: Wayne (Zac Moon), Oliver (Langston Belton) and Megan (Julie Ann Earls). Each, in their own way, holds ambitions out of place in a house known for mediocrity, amiableness and risk aversion. The nerdy Wayne dreams of being a hero. Oliver, a math prodigy, wants to master magic. Megan longs to join the dark side like her estranged mother. Success in their respective endeavors, for the most part, remains elusive over the ensuing seven years. The same can be said for the rest of the Puffs, a ragtag group of dopey but determined mages whose greatest collective wish is simply to not come in last—again— in the wizarding school’s annual House Cup competition. “Third or nothing!” is the best rallying cry this downtrodden crowd can muster. That includes Cedric Diggory (James Fouhey, who later gives a virtuoso performance as Voldemort), the most well-known Hufflepuff in the Harry Potter series, and the rockstar ringleader in this tale. Ingenious sets, costumes and props by Madeleine Bundy are often cause for hysterics in their own right, while jokes in Cox’s script arrive with relentless speed. Though Harry Potter novices will find many wisecracks among them to enjoy, the greatest rewards await those who’ve devoured all the books, all the movies, and all the cultural conversations surrounding the series. Indeed, only a true Potter nerd could catch jokes about the heft of the Order of the Phoenix book, a major casting change in the Prisoner of Azkaban movie, and questions about Albus Dumbledore’s sexuality. While Moon, Belton and Earls each give excellent performances, Puffs succeeds above all else as an ensemble piece. The Puffs are a tight-knit and collaborative bunch. Likewise, the actors playing them—as well as a whole host of professors, villains, and other magical figures— work extremely well together. Under Kristin McCarthy Parker’s expert direction, the fast-paced action—rapid entrances and exits, costume and character changes, leaps in time and space— proceeds flawlessly. At just the right moments, miraculously, she’s able to slow things down for moments of unexpected poignancy. Those moments are more powerful, and more prevalent, than one might expect in a show where, generally, the laughs are the main attraction. But Cox, more than just a comedy wizard, also knows how to tug at an audience’s heartstrings. His Puffs, ultimately, are not simply clowns, they’re shining examples of the virtues of everyday, unglamorous persistence. They’re also reminders to consider the contributions of those among us most often overlooked. By all means, go behold their long-overdue time in the spotlight. Use floo power if necessary. You’ll be glad you went.